'A work full of integrity and of the grit, graft and grace that comes with it. Stephanie Land's memoir is an essential manual in the sort of resilience, hope and diligence many of us will be fortunate enough to never experience. Maid comes from the gut not the gutter. Stephanie Land was meant to be a writer.' LISA BLOWER, award-winning author of Sitting Ducks 'There's two stories in Maid. One is of the grind, agony and precariousness of poverty and the systems and stigma that mindlessly trap people in it. The other is a love story - of a mother and daughter, but also a woman's love for herself when world has turned its back on her. An important book giving a powerful voice to those who are too regularly overlooked.' MARISA BATE 'Heartfelt and powerful...Land's love for her daughter shines brightly through the pages of this beautiful, uplifting story of resilience and survival.' 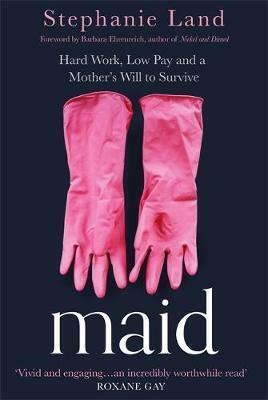 PUBLISHERS WEEKLY 'Stephanie Land's heartrending book, Maid, provides a trenchant reminder that something is amiss with the American Dream and gives voice to the millions of "working poor" toiling in a country that needs them but doesn't want to see them. A sad and hopeful tale of being on the outside looking in, the author makes us wonder how'd we fare scrubbing and vacuuming away the detritus of an affluence that always seems beyond reach." BARBARA EHRENREICH, international bestselling author of Nickel and Dimed 'Marry the evocative first-person narrative of Educated with the kind of social criticism seen in Nickel and Dimed and you'll get a sense of the remarkable book you hold in your hands. In Maid, Stephanie Land, a gifted storyteller with an eye for details you'll never forget, exposes what it's like to exist in America as a single mother, working herself sick cleaning our dirty toilets, one missed paycheck away from destitution. It's a perspective we seldom see represented first hand - and one we so desperately need right now. Timely, urgent, and unforgettable, this is memoir at its very best."